It’s all about sharing lately—specifically, the sharing economy. Find a place to crash with Airbnb. Hail an Uber ride from your phone. Walk down a city block, pick up a Zipcar for an errand, and park it in an entirely different spot for someone else to use. But the sharing economy is a bit of a misnomer—there really isn’t much sharing at all. It’s actually an access economy. For consumers, this is a relatively new concept, in which products, property, and even everyday activities like driving become services with income. This isn’t so new for manufacturing, though. It’s been happening for years, with access to machines for hire. Say a factory has a certain machine you need for molding a plastic product. You can access the factory’s machine and produce your toy, bottle, or handle. Your order is shipped, and you take it from there. Only the largest corporations can afford to build their own factories, and even still they don’t produce everything. Companies pay for access to “share” those machines that manufacture and package their products, parts, widgets . . . you name it. There’s one thing about manufacturing, though. It’s always trying to stay ahead of the curve—for good financial reasons, of course. Now, the industry is on the cusp of even bigger breakthroughs for access and efficiency. “Sharing” manufacturing capabilities is reaching new levels both in equipment and ideas. And this time, it even includes consumers, too. Accessible Software and Local Makerspaces. Any product first starts with design, and, now, anyone can be a designer. Whether you’re an everyday consumer, a burgeoning maker, or a trained industrial designer, you can get in on the action—be it furniture, shoes, costumes, or the next connected product. Design software has never been more accessible for any level, from very beginner to pro, with products like Tinkerplay, Tinkercad, or Autodesk Fusion 360. Manufacturing doors have swung wide open. There are the local TechShops popping up around the country. With one membership, you can gain access to the 3D printer or CNC machine of your dreams. More and more public libraries—from Cincinnati to Chicago to San Diego—are also creating makerspaces for patrons to freely access. 3D printers overall are just becoming more accessible. You don’t even have to access the actual machine if you don’t want to get hands-on. It’s as close as your local Staples or The UPS Store, where you can 3D print at their retail outlets. You can upload a design to have it printed and shipped by Shapeways or find a local printer on 3D Hubs. If you can design it, you can 3D print it. And guess what? You can share it, as well. Sites like Instructables provide new ways to take your design to the world, or entire product marketplaces like Etsy can help you sell it. It’s Not Just GE Anymore. It’s GE and You. The new manufacturing “sharing” is going corporate, too. Product companies don’t just want your feedback anymore; they want you to be a part of the design from the get-go. 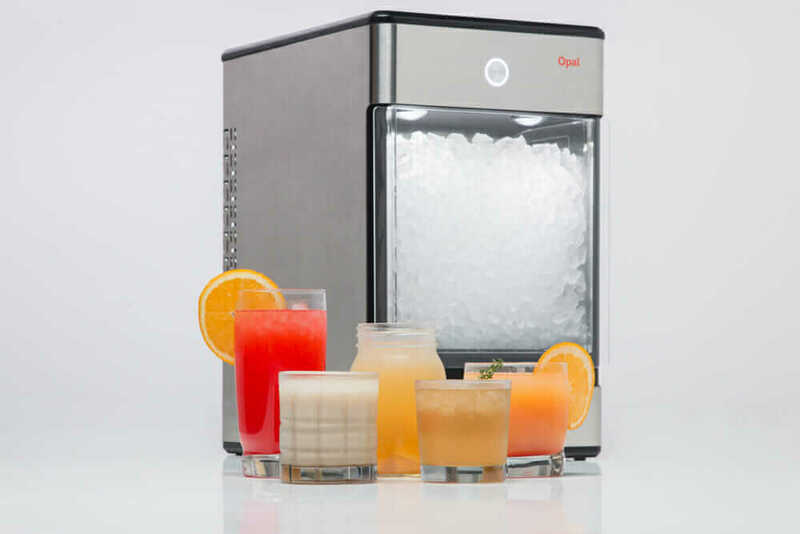 Opal is a countertop nugget-ice maker designed by the FirstBuild community. Courtesy FirstBuild. Through this co-creation, an entirely new dynamic is happening now. Companies can directly innovate alongside users and other designers. Gone are the siloed days. FirstBuild is also manufacturing designs in a microfactory, a growing trend that’s all about incredibly rapid prototyping, fabrication, and assembly—all under one roof. Ideas are flooding into the online site from the 7,500 (and growing) community members. Take the recent success of GE’s Opal Nugget Ice Maker, designed for those who love soft, chewable “nugget” ice. According to GE, “By product development standards—it can take as many four years to come up with a new appliance—Opal’s design is approaching warp speed. It was only in March that FirstBuild challenged its community to develop a compact nugget-ice maker capable of producing up to one pound of nugget ice per hour. From four years to four months for a manufactured product? A 3D printer that isn’t much further than your own backyard? Sharing never looked so good.